With that being said, this delightful cake shouldn't make you feel guilty...at all. The recipe comes from my beloved Cooking Light cookbook (from my fabulous sister & brother-in-law!). I actually made this back in the fall to take to a friend's house - they were in charge of the meal, I was in charge of dessert. I mean, people just know me all too well! Because I absolutely enjoyed this (as well as my husband), I decided to make this for Easter. I knew I had to have dessert, but I wanted something light and refreshing. With jam instead of frosting, this is definitely a unique twist on regular cake. Enjoy! Place granulated sugar, butter, and vanilla in a large bowl; beat with a mixer at medium speed until well blended (about 5 minutes). Add eggs, 1 at a time, beating well after each addition. Lightly spoon 2 1/4 cups flour into dry measuring cups; level with a knife. Combine 2 1/4 cups flour and next 4 ingredients (2 1/4 cups flour through nutmeg), stirring well with a whisk. Add flour mixture and milk alternately to sugar mixture, beginning and ending with flour mixture. Pour batter into prepared pans; sharply tap pans once on counter to remove air bubbles. Bake at 350° for 25 minutes or until a wooden pick inserted in center comes out clean. Cool in pans 10 minutes on a wire rack; remove from pans. Cool completely on wire rack. Place jam in a small bowl, and stir with a whisk until smooth. 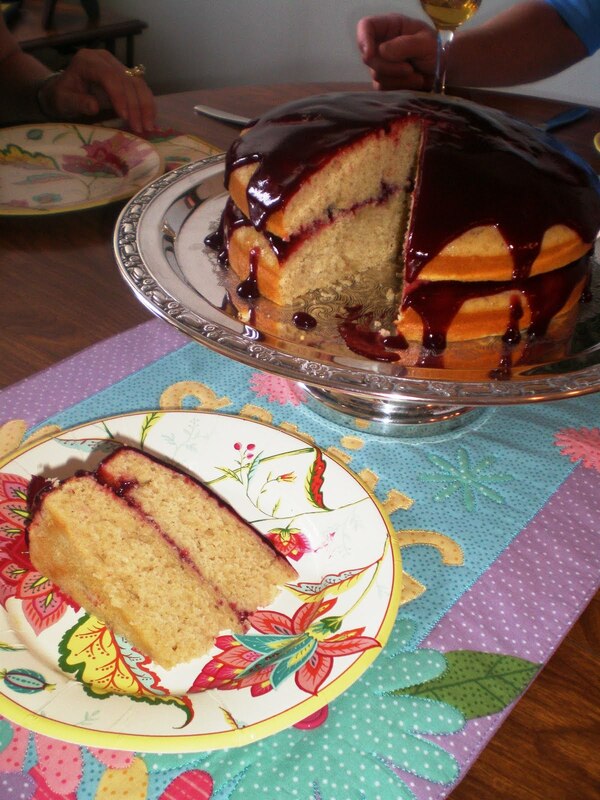 Place 1 cake layer on a plate; spread with 1/2 cup jam. 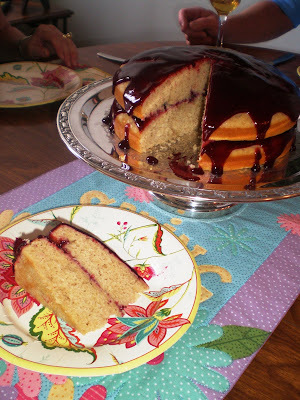 Top with other cake layer; spread remaining jam over top of cake. Sprinkle with powdered sugar - if desired. This looks absolutely delish and I am so excited to try it. Especially since it uses jam instead of frosting! !